The Bike Valet is located in front of Victoria School and running August 2- August 11th. 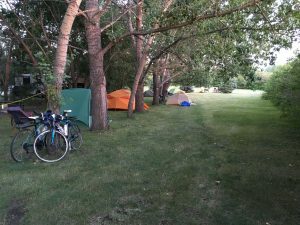 The Saskatoon Cycles Bike Valet is a FREE services provided by Nutrien Fireworks Festival. You can find more information by visiting, http://nutrienfireworksfestival.ca/participate/bike-valet-service/ The valet will run from 5 pm until 11 pm on both Friday and Saturday evening. The Broadway Business Improvement District's annual Broadway Street Fair on Saturday, Sept. 8 will also feature the Bike Valet. Come park your bicycle and take in the street performers, vendors, artists, musicians and dancers. The Hampton Village Community Association is hosting Cinema Under the Stars. Our Bike Valet will be on-site for anyone who wishes to ride their bikes to the movie. The valet is open from 5-11 pm, and we appreciate that our friends in Hampton Village Community Association asked us to be part of their awesome event. Cycling Shorts is a fundraiser for the Bridge City Bicycle Co-op that features short cycling films, a silent auction, 50/50, a cash bar, great company, and more!